Why Wat Phan Tao is special ? The temple is the former monastery and quarter and the area for molding Phra Attaros Buddha of Wat Chedi Luang. Later, it was known as Wat Pun Tao. In the olden days, Chiang Mai people called the temple “Bhan Thao” (Pun Tao) which means making only one merit will return the maker one thousand times as many as one merit. Then, the name becomes widely known as “Pun Tao” due to mishearing. Another possibility for the name is that the temple is the place where thousands of metal melting furnaces for Buddha images are situated; therefore, the name derives from this. What to explore at Wat Phan Tao? In this temple, the most impressive and perfect monastery of the province is located here. 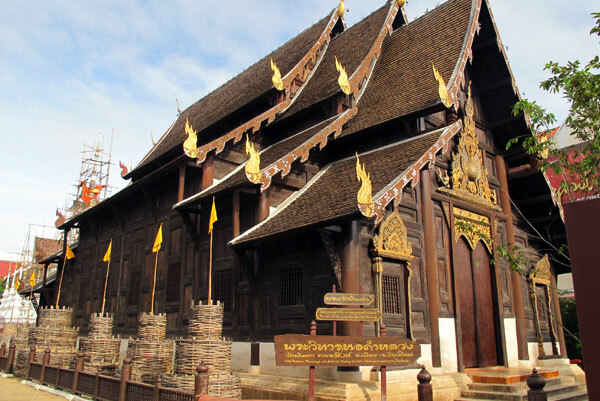 The structure is made of teak in Chiangsaen style. Formerly, it was “Ho Kham” or “Khum Luang,” the residence for Phra Chao Mahotarapratessa, 5th King of Chiang Mai. In the reign of Inthawichayanon, 7th King of Chiang Mai, he had the residence dismantled as a charitable donation to Wat Pun Tao. Moreover, tourists can be impressed by the about-100-year pulpit elevated in ancient style. In the rear of Ho Kham is the principal bell-shaped pagoda of the temple surrounded by classical pagodas. Spending time visiting the temple on religious holidays would be the best idea, especially on the night the temple organizes the light waving rite since the temple will be illuminated with candle flames flickering all over the temple court and a number of novices and monks will meditate there. In February, the temple will create a garden of 3,000 tulips in full bloom around the temple garden and court. Hence, the temple is worth visiting. During the day, you can witness the spectacular of the monastery; other hand, in the night, the temple is illuminated with candle light and pleases the tourist enormously. How to get to Wat Phan Tao? By walking the tourist can visit Wat Phan Tao by walking from Ta Pae Gate along Rachadamneon Road, it ‘s about 600 meters..
By car, it’s very easy to get to Wat Pan Tao by personal car as well just follow the camp below..
You can get there by tuk-tuk (agree on the price before leaving) or by rented bicycle. When you're there just pass the temple and have a look at the beautiful garden behind it. The temple is located directly next to the better known Wat Chedi Luang. I had walk past this temple many times in the daylight hours and after walking through the city and visiting the various suggested temples, I had assumed at this point that it was just more of the same old, same old.....I could have never been more wrong in my life! after finishing a photoshoot on sunset at the neighbouring temple (Wat Chedi Luang Worawihan) I was out the gate to avoid the mobs of annoying tourists, something caught the corner of my eye. maybe it was the soft absent lighting on the plethora of flags lining the side of the actual temple structure, I can't say for sure but, I had this feeling of being drawn to the place.when I walked through the gates and delved further into the temple grounds I actually remember standing frozen and slacked jawed at what was there before me, not only visually but the deep sense of energy and peace in this place could simply not be denied. This is a temple that many would not see. It is worth a visit. It is quite unique in that it is built of teak. It is in the lanna style and contains some temple bells, manuscripts and an interesting mosaic. I had walk past this temple many times in the daylight hours and after walking through the city and visiting the various suggested temples, I had assumed at this point that it was just more of the same old, same old..... I could have never been more wrong in my life! after finishing a photoshoot on sunset at the neighbouring temple (Wat Chedi Luang Worawihan) I was out the gate to avoid the mobs of annoying tourists, something caught the corner of my eye. maybe it was the soft absent lighting on the plethora of flags lining the side of the actual temple structure, I can't say for sure but, I had this feeling of being drawn to the place. when I walked through the gates and delved further into the temple grounds I actually remember standing frozen and slacked jawed at what was there before me, not only visually but the deep sense of energy and peace in this place could simply not be denied.